In a recent post, I discussed the work of Graham Turner, who has tested model outcomes from the Limits to Growth effort against empirical data. Turner's comparison shows that the business-as-usual (aka "standard run") model from Limits to Growth seems to be tracking pretty well against the data on measures related to economy, environment, and population. Although model and data have been agreeing pretty well so far, the hard part of the forecast hasn't yet been tested. 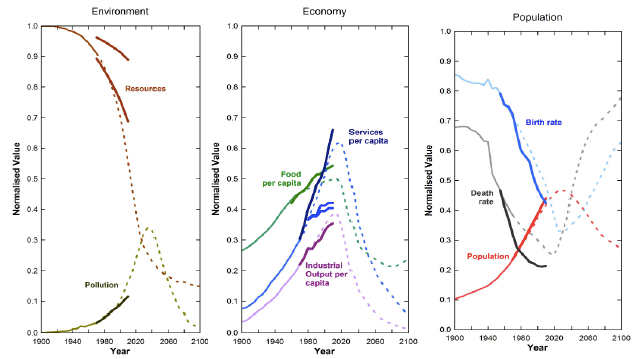 Between approximately 2010 and 2040, the model predicts that Industrial_output_per_capita, Services_per_capita, and Food_per_capita will stop rising and start falling, followed by similar reversals in Population and Pollution. Meanwhile, Death_rate has been falling and is forecast to turn around and start rising. Time series graphs from Turner (2014) comparing Limits to Growth standard run scenario (dashed lines) with empirical data (thick solid lines) through 2010. Provenance: Figure 1 of Turner, G. M. (2014). Is global collapse imminent? An updated comparison of The Limits to Growth with historical data In L. Rickards (Ed. ), Melbourne Sustainable Society Institute Research Papers (Vol. 4). Melbourne: Melbourne Sustainable Society Institute. Reuse: Fair use claimed for purpose of commentary. One of these inflection points seems to be beginning to show up in the data: Turner's graph shows that global Death_rate has flattened out and begun to rise ever so slightly. Why might this be? First, I asked an epidemiologist. Without hesitating for a moment, he said that the change was probably due to the spread of obesity and related complications. He said that obesity is spreading around the world, along with the spread of processed food. There are now obese children in places like India and sub-Sahara Africa, places that we have previously associated with hunger. Obese adults are dying of heart disease, complications of diabetes, and obesity-related cancers. Next, I asked an environmental scientist who thinks about phenomena on a global scale. He said that it must be that the impact of global climate change is beginning to bite. Climate change influences mortality rate via heat waves, food security, nutrition, and the poleward spread of tropical disease. Then I looked into the fine print of Turner (2014). Opening the World 3 black box, he saids that death rate begins to rise in the World3 model because of a decrease in food_per_capita and services_per_capita, where services includes education and health care. Services_per_capita decline because of less capital investment in the services sector. The decrease in food_per_capita is caused by decreasing capital investment in agriculture, as well as by harm to agricultural land from pollution. The underlying reason for less capital investment in agriculture, health and education is because more and more capital is being invested in non-renewable resource recovery. This, in turn, is because resources are becoming more scarce and difficult to extract. Understanding of the structures, processes, and mechanisms of the represented system. In the case of the death rate graph, all of the experts had the same graph to look at (factor 1), and I'm sure that all were 100% competent in the representational strategy of a simple time series graph (factor 2). This leaves factor 3 to explain the three wildly differing interpretations. The three experts had deep expertise in different aspects of the human-Earth system, and each drew on their area of expertise to develop an interpretative hypothesis about the available data. They all looked at the same data visualization and what came to mind was what was what they cared about, what was important to them, as with the classic Rorschach inkblots. From the point of view of someone (also me) who studies complex systems and how people understand them, I think this is a case where a single observable phenomenon cannot be fully explained in terms of one causal process. Health consequences of obesity, climate disruption, and resource limitations could all be contributing and interacting with each other and with additional stressors to cause a reversal in the trend of the global death rate. Turner's work: Turner, G. M. (2008). A comparison of "The Limits to Growth" with 30 years of reality. Global Environmental Change, 18(3), 397-411. and Turner, G. M. (2014). Is global collapse imminent? An updated comparison of The Limits to Growth with historical data, MSSI Research Paper no. 4. Melbourne Sustainable Society Institute, University of Melbourne. Death Rate: I haven't been able to find any other reports of global death rate flattening or increasing. There have been numerous press reports about a study showing that death rate is rising for middle-age white Americans, due to "an epidemic of suicides and afflictions stemming from substance abuse." Turner (2014) says he got his population data from the EarthTrends database of the World Resources Institute, but a visit to that site sadly reports "The Earthtrends website was very popular for many years but it is no longer maintained by the WRI or available anywhere else." The fine print of Turner's appendix says that the population data from 2006 to 2010 is a forecast so I went looking for more recent data. I found an interactive grapher at index Mundi, which takes its data from the CIA World Factbook. It shows a small upturn in World death rate from 2008 to 2009, followed by a return to slow decline, with the decline rate slowing to almost nothing (0.01/thousand) from 2013-2014. However, the same page points out that "most countries will eventually show a rise in the overall death rate, in spite of continued decline in mortality at all ages, as declining fertility results in an aging population." Obesity: The World Health Organization Fact sheet on Obesity confirms that "most of the world's population live in countries where overweight and obesity kills more people than underweight." Climate change and mortality: Many articles on this topic lead back to a 2012 report commissioned by 20 countries vulnerable to climate change from DARA International. The report, called "Climate Vulnerability Monitor: Cold Calculus of a Hot Planet," tallies up both deaths and economic cost, per country, in 2010, and forecasts changes to 2030. The report attributes 400,000 deaths per year to climate change. Technical Summary. Full Report. A more recent report comes from the Lancet: Health and Climate Change. Gross Planetary Product: I also came across a possibly relevant article by a Dutch professor, called We are Shrinking! The Neglected Drop in Gross Planet Product, which says that the global equivalent of GDP decreased by 4.9% in 2015 according to International Monetary Fund data. It seems possible that this could be the beginning of the reversal of Industrial_output_per_capita forecast by Limits to Growth. Pollution: The empirical dataset that Turner used as his test for persistent Pollution was carbon dioxide emission. Global carbon dioxide emissions stropped growing and began to drop in 2015, according to data recently summarized by Nature magazine. The experts and agencies cited by Nature remark on the "unusual pattern of a slowing in carbon emissions, despite a growing global economy." I guess they didn't read the Gross Planetary Product article cited above. It seems possible that the bending of the carbon emissions curve could be the beginning of the reversal of the pollution curve as forecast by Limits to Growth. Hi Kim, Thanks for the provocative reflections. As I recall, all of the model scenarios reported in Limits to Growth lead to overshoot and system collapse except for one: global commitment to reduce per capita consumption of resources and manufactured goods. Our consumptive habits, collectively, are killing us. So, I would like to emphasize the importance of your third cognitive strategy: Understanding of the structures, processes, and mechanisms of the represented system. We need to take a hard critical look at capitalism which requires continued growth and expansion of markets and use of resources to succeed. Invest today for anticipated gains in the future. Capitalism is really a sanctified Ponzi scheme--those who get in on top will "win" to the exclusion and detriment of everyone else. Maximizing corporate profits (for stockholders) in the short term, invariably leads to harm to the public good (e.g., environmental degradation--we don't need no stinkin' environmental regulations; worker health and safety--it's cheaper to replace an injured worker than to install health and safety equipment). And of course, this economic structure is not sustainable because there are necessarily Limits to Growth in a closed Earth system. (See also the 2nd Law of Thermodynamics). We can't simply find an economically viable alternative to a critical resource such as clean water or arable land or marine fisheries... as Milton Friedman would argue that when one commodity gets to be too scarce and expensive another will emerge. An economic system that requires continued expansion of markets, consumption, and extraction of finite resources will surely lead to collapse. Hi Dave, Thanks for the comments. The Limits to Growth scenario that did not lead to overshoot did indeed include mechanisms to reduce per capita consumption of resources and manufactured goods, as you state. In addition, it also included robust mechanisms to reduce the rate of growth of capita, people. As I recall, birth control was modeled as improving to the point of being perfectly effective, and the desired number of children per couple was modeled as decreasing to 2.